Are you free on Saturday the 10th of September? 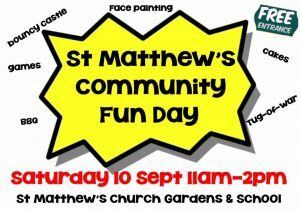 If so, come along to the St Matthew’s community fun day! It will be held at the St Matthew’s church gardens and school, starting at 11am and ending at 2pm. Entrance to the event is free. There will be lots of stuff to do for everyone, including face painting, a tug-of-war, a BBQ, various games, and a bouncy castle as well. There is also going to be a cake baking competition. We are looking for all different types of cakes, like round cakes, loaf cakes, tray bakes, fruit cake, chocolate cake and cheesecake. International cakes specific to other countries are welcome too, the judges look forward to tasting cakes they may never have experienced before. The prize for the winner will be shopping vouchers. If you think you can bake the tastiest cake, on the day please enter your cake into the competition between 11 and 11:30am. Anyone is eligible to enter. On top of that, there will be a vegetable art competition too, and children up to 12 years of age are eligible to enter. The aim of the competition is to make something really creative using only fruit and vegetables, and they can either be built at home and brought in, or built on the day. The prize will be more shopping vouchers, so put your creative caps on and impress us with your crazy, kooky designs! If you have any concerns or questions, feel free to contact FOFS at fofspreston@gmail.com.